I was moved to get out beads, etc. 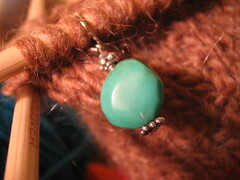 and throw together a quick stitch marker after being inspired by some of the beauties at etsy.com. On the needles is another bear. This one will have arms and legs. You can not tell from the picture, but this one is to have a striped sweater. I experimented with the "Jogless Join" technique when changing the colors, and wish that I had not. I find the jog that results from changing colors is less offensive than the pulling and gappiness that resulted. I'm not too worried about it, I figure I can finangle it all out with a little bit of blocking. But for future reference, I'm not going to fool with the fancy join. I'm also using felted joins to do all my color changes - I just learned this technique and am smitten - and I think that also helps minimizing the big jog that typically results in color changing when knitting in the round. I like em without limbs now. I think your peanut should stay limbless!